Right, I installed the latest and greatest tools from SAP last week, and I ran into a load of trouble. It all starts in your SAPGUI configuration. You need to know where your config files are stored. In case you have multiple saplogon.ini files, you can hook them up in your SapLogonTree.xml and they will be migrated as well. In some cases all of this fails and the SAPUILandscape.xml stays empty. Arf. In such cases, you can launch the NWBC 5.0 and restart the migration from there. Be sure to select the right view in both your NWBC and your SAPLogon as the tree is structured differently from what it used to be. Getting strange error messages on your NWBC navigation tree? Those have to do with your menu selection. Typically in the NWBC, you’ll want to see your specific user menu, rather than the general SAP Menu. Normally the user menu is defaulted, but if you’re like me, and you click on everything, you may have turned it off. From the NWBC menu, you can go to settings->personalization and make sure the SAP Menu is unchecked. Some buttons and screen areas tend to disappear in this new theme. Take transaction PFCG for example. If I want to add a folder as a sidepanel, I can’t see the button for extra node options any more. So do yourself a favor, and wait until some patches appear. I know, this is a bad practice, but if you have 300 systems in your SAPLogon like me, it’s an easy solution. Which, BTW, no longer works. You can still enter your password in the shortcut, but after a restart of the SAPLogon, they are removed. In the sapuiLandscape.xml file, you can manually add your passwords for each shortcut with the addition passwd=”<pass>”. Obviously, this creates a securiy risk, so I don’t advise it. To prevent loss of your password entries, just make the file read-only. [Edit] Don’t make the SAPUILandscape.xml file readonly. While it will still work for you initially, at some point in time, NWBC is going to make a backup of the file, and if it can’t access it’s own backups, it won’t start at all! You may have experienced that your NWBC logon entries (so not the SAPGUI logon entries, but the specific NWBC entries) get duplicated every time you launch the NWBC. At least I have. Which is really annoying, cause it makes your NWBC go slower and slower on each launch. And after about 20 relaunches, you get a massive SAPUILandscape XML file and neither your NWBC, nor your saplogon will start anymore. and set it to True. That should stop the NWBC from migrating your NWBC entries all the time. At least it did for me. the Password addition in shortcuts doesn’t seem to work anymore, at all. not in SAPGUI, not in NWBC and it ignores the regedit entry to store passwords completely. connect to the NWBC service of your SAP system. let the browser remember your password. PL5 for NWBC was released a couple of weeks back. After that, the regular shortcut worked just fine. Looks like the release was not tested properly before releasing it to the public. I am using Blue Crystal-Theme without greater problems so far. But inspired by your blog I started PFCG. 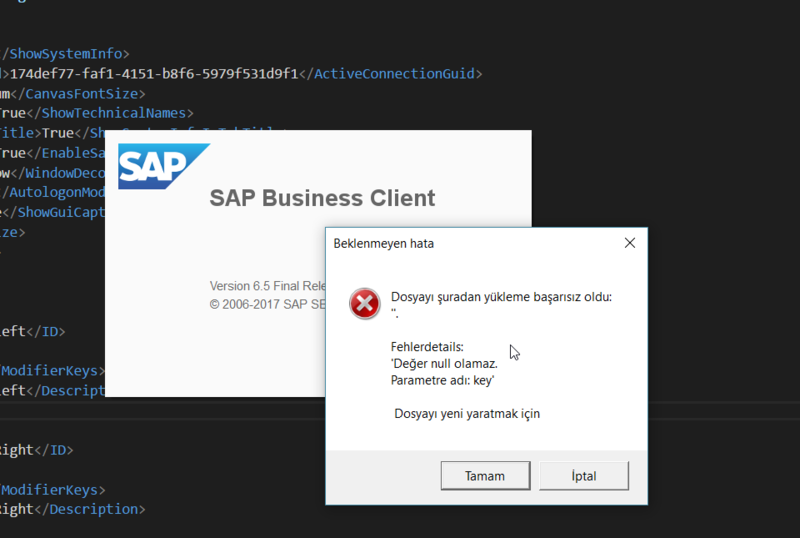 It instantly crashes my SAP Gui I tried it on a 7.40 ERP and also on a 7.02 ERP. Auch! maybe the blue_crystal theme was an afterthought and they didn’t spend enough time testing it? Apart from the theme, and the initial trouble, I’m quite pleased with the new sapgui and the NWBC. There don’t seem to be that many changes, but the logon tree and the workspaces already make a difference for me. “glad” to hear that there are othere who is also experiencing problems with the new 7.40/nwbc 50 combo. I cant launch PFCG either – i crashes rigt away. There are more issues than just the ones I listed. for example: the code editor keeps crashing if you connect to a NW 7.0 system and try to use the new-frontend editor. If you stick to the old editor, it doesn’t crash. I use the NWBC5 for all my activities (demos, development, customizing,…) and I find it to be unstable and buggy. So my advise would be, wait for patch level 3. Hopefully SAP will tackle many of these issues. Fantastic …….Enjoyed every bit of it …..
That is really helpful, it helped me a lot with my logon pad. which i lost because we used a serverside logon pad. Great blog post! Thanks for sharing. I had many issues with the initial release of SAP GUI 7.4 as everyone else, but I just downloaded the SAP GUI 7.4 Patch level 1 that was released today and it fixed many of the issues that I was seeing (Including missing router strings, SAP GUI and NWBC 5.0 not working together, color issues with the ABAP editor). I also checked PFCG with the Blue Crystal theme and it looks like SAP fixed the issue with the missing buttons as well! Let me know if you have any thoughts on the patch and if there are any issues that anyone else is still seeing. I too installed PL1 for the SAPGUI 7.40, and it fixes quite a lot of issues I encountered before. (if not all) Looks like I can start recommending the new GUI and NWBC now to my customers. Nice blog. I had found these solutions after much efforts and then came across your blog.My luck.. I have one last problem for which i could not find any help or solution. I have installed NWBC 5.0 along with SAP GUI 7.40. Both xml files are in the Roaming folder and old ini files were migrated correctly. Only issue is I cannot create Group/Server Selection connection types in NWBC 5.0. It gives the error hostname NiHL GetNodeAddr unknown . I cud create the same connection entries when i install SAP GUi 7.4 w/o NWBC. What shud i be missing? i have not set any env variable for configuration file path nor any other cosmetic changes. What can be the issue and if u know of any solution for that? Thank you for this blog. It helped me solving the issue with the duplicate entries in the NWBC. However, I had to use a slightly other procedure. I started the SAPLogon first, which converted my SAPLogon.ini to the XML files. After each start I got a new entry called “NWBC Admin Configuration (001)(001)” in the SAPLogon and the NWBC got duplicates also. Even when setting the registry entry DontUseSapGuiMigrationTool to True. To solve it, I removed the SAPUILandscape.xml, SAPUILandscapeGlobal.xml and the NWBCOptions.XML and NWBCOptions.BAK like you wrote, but also the favorites from NWBC. Then I put back the SAPLogon.ini and set the registry option as you described. Next thing was starting the NWBC and performed the migration by SAP GUI tool. Both NWBC as SAPLogon execute, without generating the duplicates. I’m using SAPGUI 7.40 patchlevel 1 and NWBC 5.0 PL2 from a new installation, running on Windows 7 x64. I have uninstalled the previous versions of NWBC, SAPGUI 7.30 and related addons before the installation. Also i removed all previous installation locations. I left the Registry untouched. Maybe its of use for somebody else. I experienced also the duplicate entries in my NWBC. I just removed the duplicate entries from the client (no fuss with XML-files). The folder LShape was missing in my registry but I just added it and now it works. ps. : I run on NWBC 5.0 PL3 and Gui 740 PL1. Currently I am working to create new frontend server to upgrade current SAPGUI clients. Just want to get your opinion. Is it stable enough to use SAPGUI 7.40 as the frontend server and upgrade current SAPGUI clients? I have tried the patch 0 and it’s really headache. Is it Patch 1 a lot better? I wouldn’t use patch level 0 if I were you. I understand that many customers are weary of using latest versions, as they contain a lot of bugs, but in this instance, definitely go for patch level 1 because it fixes a heapload of issues in the initial release. I’ve tried your hint for “passwords in shortcuts” but it doesn’t work. Do I have to place the “passwd”-tag at a certain position? Same story. How can we activate storing password anywhere for shortcuts? I ‘m looking a solution too. Big Thank you!!! It worked. If you install both NWBC and GUI this cause not storing password in sap shortcuts. I have uninstalled NWBC till find(or SAP offer) a better solution to save pass with shortcuts. I uninstalled NWBC and placed passwd=”with_my_password” in the landscape file. Did you do anything else? After Patch 2 has been released and without NWBC 5.0 installation, I found out SAPGUI 7.40 is quite stable and didn’t find any bugs at least for 10 days used. I think one of the main issue because the integration between SAPGUI 7.40 and NWBC 5.0. So if you plan to move from SAPGUI 7.30 simply because it will reach end full of support by July 2015, just move to SAPGUI 7.40 Patch 2 without NWBC 5.0. You can put the password after that. But as I have said in my previous comment, I only use SAPLogon 7.40 Patch 2 and without NWBC. I’m well aware of the regedit settings, but for some reason, they don’t work anymore on my machine. It could be limited to my machine in particular, but I’m not certain about it. Thanks for reposting the procedure though, as there were multiple questions regarding passwords. On my other computer after applying latest patch password filed is visible on 7.4(03) without NWBC5. I hope someone will find a solution for our issue. Community, any ideas? Fixed a problem with NWBC popup windows where a logon screen appears in an external browser window. Fixed a problem with portal session locks if the NWBC window is completely closed. Fixed a problem with resizing of the right side panel if a SAPGUI transaction is launched within. Fixed a problem that caused nwbc to freeze sometimes when switching the active theme. Fixed out of memory issue in landscape area. Improved integration of SAPUI5 Inbox overlayed popups (requires SAPUI5 version 1.30 and higher). Made nwbc run more stable in case of registry access issues. The error “NiHL GetNodeAddr unknown” is solved by one of these patches. This patch is in fact a new release of the complete software, so no need to install the old version. Then launch NWBC and go to Settings -> Personalize, in the chapter Logon, untick the option “Hide system selector on startup”, so that you always have the selector screen to choose the system. Launch IE -> Tools -> Options -> Tab Security ->Trusted Sites and click on the SITES button, add the server name and save. there is no more “Redo migration by NWBC” option in NWBC 5.0 PL05. Main problem is that workspace usage/creation is not unified. Regarding your comment about workspace usage/creation – you mean the saplogon.ini and now the new xml file approach? I have not tried it yet, but I have another client software from SAP (EasyDMS) that I worry will not work with the xml concept (i.e. I will have to maintain XML approach for NWBC/SAPGUI and INI for EasyDMS). In case you don’t use NWBC, you can use only SAPLogon 7.40 and this will keep the saplogon.ini as the config file similar like previous version. The XML file wont be used. Yes, understood that – but I guess I was “hopeful” that the xml file approach will make things easier at least for running GUI and NWBC. We have not yet ‘pulled the trigger’ to tackle NWBC in earnest yet, but this shared config approach helps to make me comfortable. But then you throw in ‘other tools’ that use the INI file and, ugh, have to juggle and keep them maintained/deployed to user computers. Overall, is your experience with the XML approach a positive one? The idea behind the XML approach is very good, but the initial problems with this new config method are dampening the mood. SAP GUI and NWBC in the latest versions are “ready for XML” in my opinion. And if you have EasyDMS already deployed and configured you won’t have to adapt it. I am curious, did NWBC 5.0 receive positive feedback from your endusers? 1. Time to setup the iniitial distribution/registry updates to end user desktops via corporate software distribution tool (SCCM, not the SAP installation server) and testing the ongoing approach for rolling out patches and xml/ini updates. It seems like there is “always something” that goes wrong with this! 2. “Fear” that we will start getting support calls for features of NWBC that don’t work as users try all the cool things it can do. 3. Uncertainty what we may or may not need to do with end-user roles in PFCG so that a user’s first logon experience is positive (e.g. may be wrong,but I think if someone who has lots of roles assigned might get a messy page). I’m sure there is an answer for this, just haven’t looked hard enough. Hi Eric, regarding sapuilandscape.xml and the stability, could you test PL03? I just quick test and it seems quite ok now, finally. Regarding other application such as EasyDMS, ACL which still use saplogon.ini, you can use converter tool from xml to ini. Its available under saplogon for Java. For maintenance xml and ini, I just use group policy and bat files. It’s quite straight forward. The bat script will be a lot easier if use standard installation directory as well as one type Windows version in user site. For NWBC and role menu, via setting in PFCG, we can hide menu from certain roles for NWBC. Create some roles only for menu standarisation. And hide the rest of menu from others. no, I mean xml file approach only because all three tools are using the new xml file approach because of NWBC 5.0. But the saplogon.ini file does not disappear because of this, so your/other tool/s should still be able to use it. But you probably would have to maintain both configuration concepts individually and the saplogon.ini file manually via Notepad. SAPGUI PL03 has been released and still contains quite interesting notes. Actually, I got above issue since first time installing SAPGUI 7.40 (PL0) and together NWBC 5.0. Then I decided to install SAPGUI 7.40 only without NWBC. The problem has been solved by PL02. I hope this PL03 really solve it when you put both together. Yes, this release and whole process of updating the GUI is horrendous… I go to SAP Support Portal and download the Core and should get the latest Version with Patches. Not then have to immediately Patch the download. I’ve come to accept that that the family of ALL client software is excluded from the Run Simple mantra at SAP! Kidding aside, it is this complexity and cost that helps to create a desire to put things into the cloud. Although then you deal with browser compatibility issues. Cloud does not necessarily mean that you’ll have a browser as client. Other than that: Typically, the end-user does not install the client software. this is normally done by someone from IT. As you can see, I was pretty fast to raise a bunch of issues with the release of the NWBC, but that doesn’t mean I think it’s uphauling. I Believe the new NWBC releases are crucial in the long term strategy of SAP regarding their UX roadmap. However, it is impossible to revamp the entire Front-End part of SAP overnight, into Fiori. So the NWBC plays a role in that transition. Which also means that there will be more releases with minor adjustments (and bugs). We can now all sit here and complain about the (plenty) bugs, or we can raise the issues and look for solutions. With PL5, yet a whole bunch of bugs have been fixed. when installing SAP GUI 7.40 on my new laptop I experienced the same problem: all system connections maintained in the 7.30-version were gone. The data migration automatically are not execute correctly. You execute the next steps depending your configuration file. The environment variable SAPLOGON_INI_FILE=[Path]\[name] to specify the user INI. The new environment variable SAPLOGON_LSXML_FILE=[Path]\[name] to specify the user landscape file that should be created. Tsss. This is already a year old. I expected a De Saeger to be faster with adoption of new technology. Version 6 will be out soon. Thanks to this blog I was able to scratch and get away my itches …. I created an installation package including PL6. My problem: If I want to install 740 on a new pc, I have no entries in the saplogon (because there a no saplogon.ini etc. to migrate, of course). What do I have to do to get entries in SAPGUI 7.40? That way any new installation of that package would read the entries from the SAPUILandscape.xml file located on your installation server and could easily be maintained centrally. Do I Need to configure manually the Ao_app.config? Do you have the latest patches of the Sap Business client installed? Everything is described in the document above, or in the ensuing discussion. I would urge you to see if you can find any hints in the information already listed. It’s meant as a self-service troubleshooting guide. As for the Ao_app.config: I don’t know what that is, so can’t help you on that. Then replace the saplogon.ini on the server, with that sapuilandscape.xml and make sure the config of the business client, when you roll it out, points to that server-based sapuilandscape folder. Also, there is already a version 6 of the SAP business client. If you’re only rolling out version 5 now, you might consider skipping 5 and going for 6. 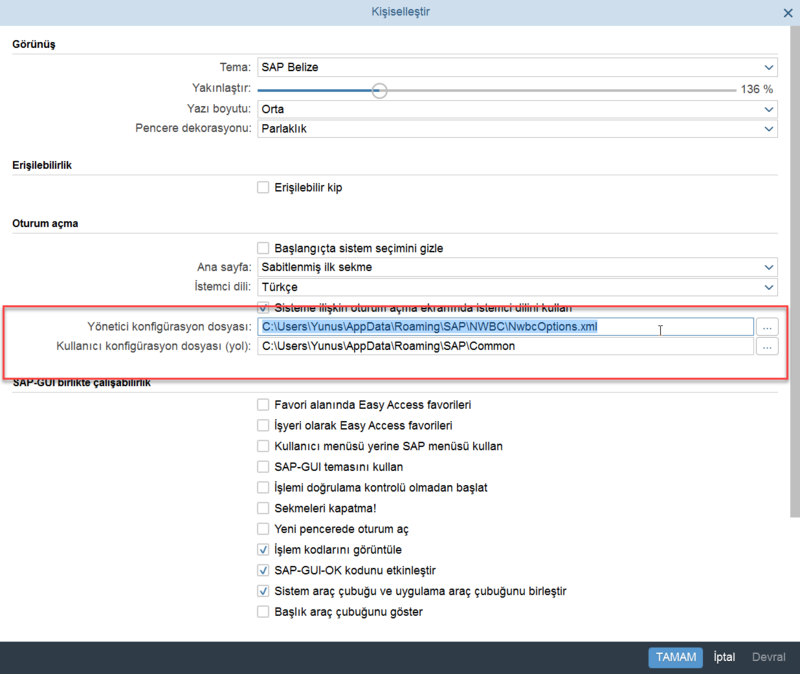 Hi, Im having the issue with the sap logon empty (SAPUILandscape.xml did not get populated automatically) so I try to use the NWBC to do the Redo migration by SAP GUI TOOL, but I dont even have the option of Extended supportability undel my Help menu, I only have SAP NWBC help and About, no other option gives me the redo migration option. Any help? Did you keep the CTRL-key pressed down whilst navigating the menu? I looked at many sources to change the keyboard settings, but none of them did not work in NWBC 6.5. I could not change the combination of Ctrl + Left and Ctrl + Right..
After that , I changed Personel Settings like that. But when I NWBC opened , It show error like that . (Key parameter can not be null. ) But I Filled it .. And It didn’t change any things..
B: it’s perhaps better to start a new Question, instead of reviving a blog on NWBC 5.0 from 2014. You may get more help there.